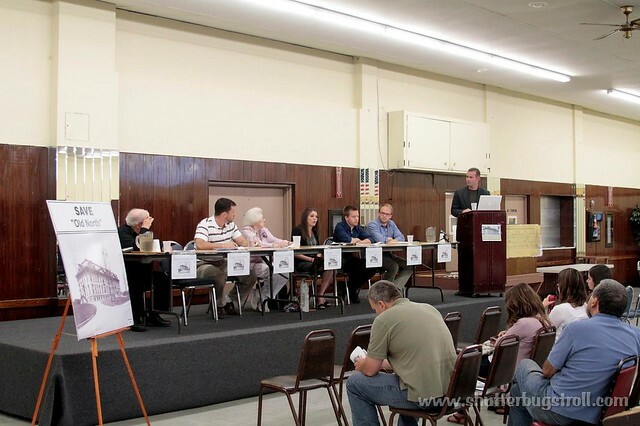 The newly formed Lackawanna Industrial Heritage Group hosted their first public hearing on the future of the Bethlehem Steel North Office building last week. Artvoice covered the hearing and Spree Editor Elizabeth Licata discussed the public hearing with WBFO in this interview. The full audio of the evening's hearing is now available. Jason Wilson, project manager at Preservation Buffalo Niagara discussed how this and future preservation projects in the City of Lackawanna will benefit from the establishment of a "certified local government" program. Darren Cotten presented his research - recent University at Buffalo Masters project in Urban Planning - about the potential reuse of the building. Darren also discussed some of his work in preparing the National Register nomination package which the Campaign for Greater Buffalo is helping to support. See this recent fixBuffalo post for additional details about Darren's work. Lackawanna Common Council President Henry Pirowski agreed to help draft a resolution which will be presented to the full council requesting the Mayor Szymanski to withdraw his support for the City's demolition plans. Mayor Szymanski, Gateway Trade - the building's owner - as well as other local, regional, state and federal elected officials, including Erie County Executive Mark Polancarz were invited to attend and participate. City planner and local preservationist Chris Hawley moderated the meeting. His opening remarks placing the City of Lackawanna's Cathedral of Industry in a broader cultural and economic context are rather compelling. Listen here. In case you missed it - the National Trust recently posted this - Grassroots Preservation Turning the Tide in Buffalo, NY - for additional background on the local effort to save this building from the landfill. The Rochester Subway blog recently posted - Lackawanna Blues: How smaller cities are destroying their future by demolishing the past - that leads with this story and provides many examples of successful reuse of formerly decaying industrial buildings. You can stay current with the story of saving the Bethlehem Steel Administration building by joining and following this FaceBook group. See also: Bethlehem Steel North Office Building - Part I, Part II & Part III. We’re preparing a new zoning ordinance to shape Buffalo’s future. It’s designed to build on the land use plan that was developed last year, and to make our shared vision for the city a reality.The zoning ordinance contains the specific and detailed laws that will govern development in our city. Please join us at an upcoming Open House to learn more about how this will benefit your neighborhood and let us know what you think. 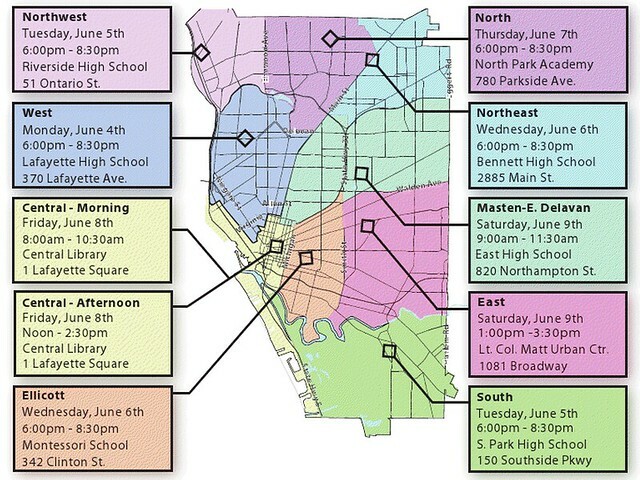 WEST: Mon., June 4, 6 pm, Lafayette High School, 370 Lafayette Ave.
NORTHWEST: Tues., June 5, 6 pm, Riverside High School, 51 Ontario St.
SOUTH: Tues., June 5, 6 pm, South Park High School, 150 Southside Pkwy. ELLICOTT: Wed., June 6, 6 pm, Montessori School, 342 Clinton St.
NORTHEAST: Wed., June 6, 6 pm, Bennett High School, 2885 Main St.
NORTH: Thurs., June 7, 6 pm, North Park Academy, 780 Parkside Ave.
CENTRAL: Fri., June 8, 8 am; or Noon, Central Library, Lafayette Sq. MASTEN/E. DELAVAN: Sat., June 9, 9 am, East High School, 820 Northampton St. The Green Code is the most important planning initiative the City of Buffalo has undertaken in decades. Plan to attend one of these open houses. For additional information about the Buffalo Green Code check out the following fixBuffalo posts, especially this one - Mayor Brown's official announcement - on Earth Day, 2010.